Anti-Wahoo protesters gathered last night before the Indians v. Diamondbacks game at Chase Field in Phoenix. 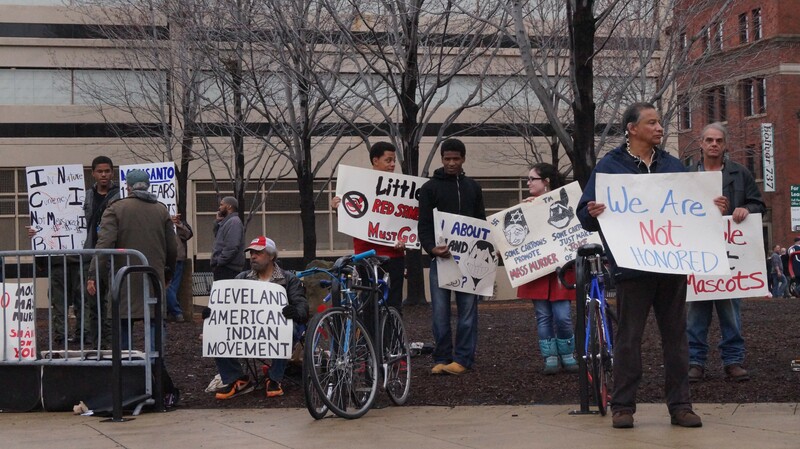 Organized by Kristy Blackhorse and the group Eradicating Offensive Native Mascotry, the protest was similar in tone and content to the opening day protests which have been a staple of Cleveland professional baseball for decades. Blackhorse's sister is Amanda Blackhorse, who filed the successful law suit which last week stripped the federal trademark rights for the Washington Redskins. At Chase Field, the Arizona Republic got a hold of a few Cleveland fans, who reiterated the prominent delusional local view that Chief Wahoo is a positive symbol which honors native peoples. "[Wahoo is] a positive figure," one fan told the paper. 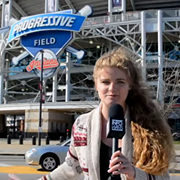 "People in Cleveland feel it's a tribe, like a community. It's not supposed to be something negative." 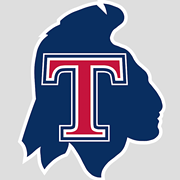 Meantime, a local American Indian group intends to file a major suit against the Cleveland Indians by late July. 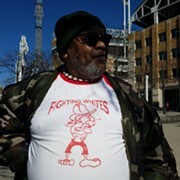 Members feel that Chief Wahoo is a racist, dehumanizing caricature.